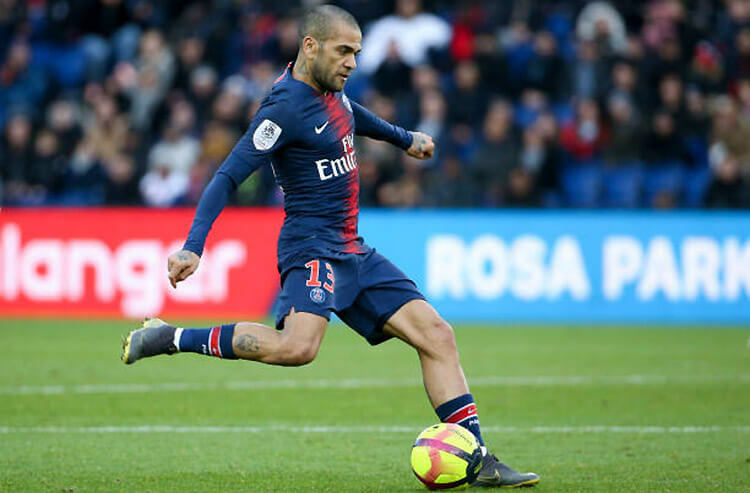 Dani Alves and Paris Saint-Germain will be underdogs against Manchester United on Tuesday in UEFA Champions League action. We dive back into UEFA Champions League betting action this week as the Round of 16 kicks off with Paris Saint-Germain missing key players for their match against Manchester United, Roma tackling FC Porto, Real Madrid counting themselves fortunate to play Ajax, while Tottenham and Borussia Dortmund hope to keep their slim championship odds alive. We break down the best soccer bets for the early-week action on the pitch. It’s hard to know what Manchester United fans are more excited – how well their team is playing, or that Paris Saint-Germain heads into Tuesday’s first leg of their UEFA Champions League Round of 16 tie missing three key players. PSG will visit Old Trafford without the services of forwards Edinson Cavani and Neymar, both of whom are nursing injury and won’t be available for either leg. Defender Thomas Meunier is also on the sidelines, leaving PSG as the +210 underdog despite having the superior roster when healthy. Man United (+137) enter having racked up 10 wins and one draw over their past 11 games. An away rout of Chievo couldn’t have come at a better time for Roma, who enter their UEFA Champions League two-leg series with FC Porto having put their recent struggles aside. Roma (+110) entered the weekend winless in three matches and still feeling the sting of a 7-1 defeat at Fiorentina, but put together one of their best games of the Serie A campaign en route to a 3-0 drubbing of Chievo. Still, they should expect a significant challenge from an FC Porto side (+275) that leads the Portuguese domestic table and has just two losses from its first 21 league matches this season. Real Madrid might not be one of the top contenders for this year’s UEFA Champions League title, but they have, at least on paper, one of the easier Round of 16 draws as they kick off their two-leg series with Ajax on Wednesday at Johan Cruyff Arena. Real are installed as comfortable -110 favorites to win the away leg on the heels of an impressive 3-1 triumph over rival Atletico Madrid, their fifth consecutive domestic victory. Ajax (+280) aren’t being given much of a shot of advancing given that they have lost each of their previous six meetings with Real Madrid, with all of those games decided by multiple goals. Tottenham and Borussia Dortmund have plenty in common going into the first leg of their UEFA Champions League elimination-round tie – most notably, they just might be the best live longshot plays available. Spurs are listed at +2,800 to win the Champions League title despite sitting third in the always-competitive English Premier League table while riding a four-game domestic win streak. Dortmund are only slightly higher at +2,500, even while leading the Bundesliga standings by a full five points over Bayern Munich. Spurs are +135 for their home leg vs. Dortmund (+210). With or without Neymar and Cavani, PSG will likely draw plenty of attention from Over bettors given their proclivity for high-scoring games in Champions League competition. The French powers have gone above the 2.5-goal total in 20 of their past 21 tournament games; the Over for Tuesday’s match is -138, while the Under is set at +100. Meanwhile, the Over looks like a superior play for Tuesday’s Champions League tie between Roma and FC Porto. The visitors have converted three or more goals in each of their previous four tournament matches, while Roma has cashed the Over in nine of 10. There could be some great value here, with oddsmakers setting the Over at -110. The most impressive part of Real Madrid’s recent dominance of Ajax is just how thorough the victories have been. Real have been leading at the half and gone on to win in each of the previous six meetings between the teams dating back to 2010, and are a tempting play at +187 to convert the Real Madrid-Real Madrid double on Wednesday. Dortmund’s defense has carried them to the Round of 16 at the UEFA Champions League, as they’ve recorded clean sheets in five of their previous six tournament matches. But they’ll face a major challenge in that regard from a Tottenham team that has scored the third-most goals in EPL play (54). A Dortmund clean sheet is set at +300 for Wednesday’s match. Arsenal might not be vying for Champions League supremacy, but they’re a great bet to go far in the Europa League, which resumes play this week. Arsenal enter Thursday’s away encounter with BATE Borisov having kept opponents off the scoresheet in five consecutive tournament games. They’re installed at +120 to extend their run of clean sheets this week. Sevilla have been a dominant Europa League club in recent history, and they’ll look to continue that run of success Thursday against host Lazio. The visiting side has completed the half-time/full-time sweep in nine of its previous 12 matches in Europa League play, but as +200 underdogs to prevail, they’re facing +375 odds of repeating the feat at Stadio Olimpico. Valencia road games have been strong Over options of late, with the Spanish League stalwart having surpassed the 2.5-goal threshold in five of its previous games away from Mestalla Stadium across all competitions. But oddsmakers don’t believe that trend will continue, making the Over a +100 option for Valencia’s Europa League showdown with host Celtic on Thursday. The Eintracht Frankfurt train is headed to Ukraine this week for a Europa League encounter with Shakhtar Donetsk. Frankfurt have been an offensive juggernaut in recent tournament play, having scored two or more goals in nine consecutive games in the competition. Bettors are getting a nice price on the extension of that trend, with Frankfurt Over 1.5 goals sitting at +162. Aaron Ramsey will reportedly become the highest-paid British player in soccer history when he joins Juventus this summer. Ramsey, who has spent the previous 11 seasons with Arsenal, will earn a reported 400,000 pounds per week with Juventus, who lead the Serie A table by 11 points and are a whopping -4,000 option to defend their league title. Barcelona will enter their toughest stretch of the calendar without one of their top midfielders. Arthur is expected to miss the next three-to-four weeks with a hamstring injury, his absence coinciding with a stretch of five away games in a six-match span. But Barca still control the La Liga standings, sitting six points clear of runner-up Real Madrid.